running in California's 21st Congressional District. If you use the Internet to research political candidates before entering the voting booth, you’ll want to use a bit of extra caution this year. The National Journal is reporting that the National Republican Campaign Committee (NRCC) has created and is promoting a series of fake news websites to spread negative information about select Democratic candidates and incumbents. 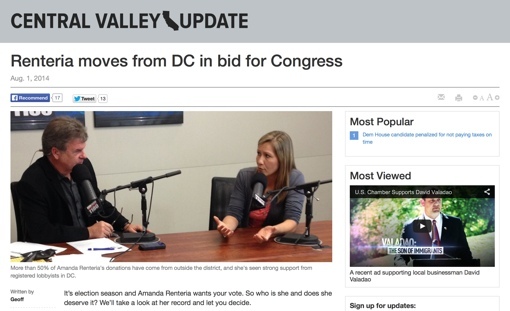 The Republican sites use innocuous sounding names like “Augusta Update” and “Central Valley Update” to appear like local, independent news sources. Articles typically begin with a non-partisan tone, but quickly turn negative toward specific Democratic candidates. Only when (and if) someone scrolls down to the absolute bottom of the screen will they notice a disclaimer stating the site was paid for by the NRCC. The partisan attack sites are being promoted via localized Google search ads and blend in with legitimate news sources. Still, misleading though they may be, the sites operate within the letter of the law. A spokesperson for the Democratic Congressional Campaign Committee predictably blasted the new Republican tactic. “House Republicans' campaign strategy to overcome their own historic unpopularity is to resort to deception—again,” said DCCC Spokesman Josh Schwerin. This is the second time this election cycle that congressional Republicans have come under fire for misleading websites. Late last year, the NRCC created look-alike sites for Democratic candidates that sought campaign contributions. Instead of those contributions going to the Democratic candidates, however, the money went to their Republican challengers instead – a possible violation of campaign law. Saul Alinsky died in 1972, about 20 years before the first Internet web page was created, so he is a little outside our news cycle. However, this story is current, and is a pretty sad example of political shenanigans no matter which “side” you’re on. The FTC has gone after marketers of acai berries supplements and bogus weight loss plans for the exact same tactics the NRCC is undertaking (see: https://www.techlicious.com/blog/ftc-shuts-down-fake-online-news-sites/). For pointing out Bilbo’s errors. It is about tech related sleaze and it needs to be brought to light. The writer should have provided the examines of other parties that have done similar misdeeds. We must assume that it is biased. Party A does something really sleazy. We report on it. Are you suggesting we should not unless we can uncover some instance where Party B did the same thing? It seems to me that your concerns reflect your own biases far more than what you perceive to be ours. However, if you have examples of other parties creating fake news sites, especially directed from its national organization, feel free to provide them here. We welcome an open, fact-based discussion.